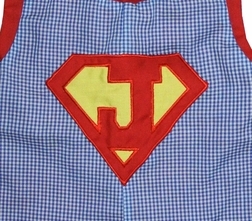 A customer asked us to design a "Superman" outfit for her little boy's birthday and here's our result. We start with royal blue gingham and make your choice of a John John or longall that fasten at the shoulders with 2 red covered buttons. 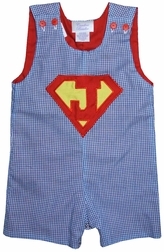 The "Superman" applique is made with your little one's initial OR, if it is for his birthday, choose a number. 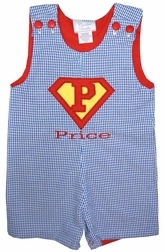 A name is monogrammed under the applique in red.